The World Economic Forum states: “Africa is no longer looking to the rest of the world for their answers. Instead, they are creating their own through disruptive and transformative technologies. And many of these have the potential to answer global challenges around big topics such as financial inclusion, risk and compliance and land rights”. A good definition of digital disruption is the change that occurs when new digital technologies and business models affect the value proposition of existing goods and services. It can happen in an entire business or an whole industry. Schumpeter distinguished between “replicative” entrepreneurs, who enter a market and make incremental improvements to compete, and “innovative” entrepreneurs, who upset or disrupt entire business sectors. 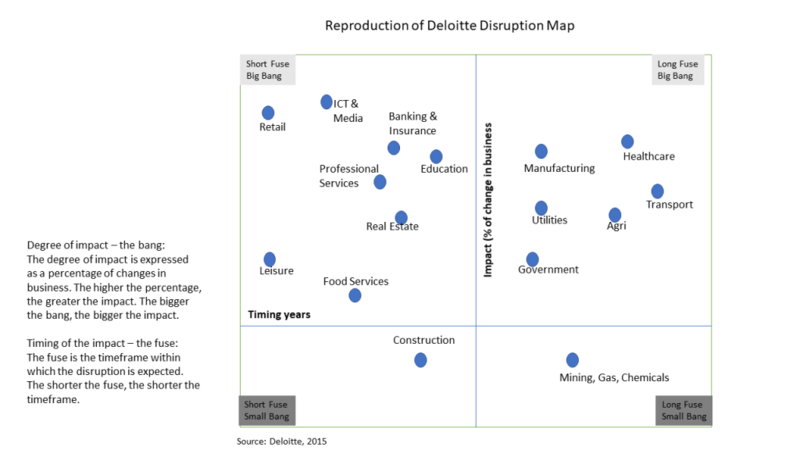 The consulting firm, Deloitte has created a disruption map which shows which industry are ripe for disruption. The best known examples of disruption are those taking place in the financial services sector. However, examples of disruptors transforming entire markets in Africa range from maternal healthcare to on-demand package delivery services, from online insurance to internet connectivity, from clean energy to alternative waste management, from transportation to mobile funding and beyond. A good example is that of the Swedish company BIMA disrupting the medical insurance market by providing affordable and easy-to-understand life and hospital insurance products that offer great value to low income consumers. While traditional insurance companies tend to regard the BoP market as unviable, BIMA identified a gap in the market and targets this market segment with tailored and affordable products. BIMA provides insurance cover of up to US$1,100 for as little as US$0.30 per month. BIMA’s target markets typically have an insurance penetration rate of less than 3%, reflecting a significant opportunity for mass market life and hospital insurance offerings. Look for entrepreneurs that are, (a) Driving efficiency in business and public service; (b) Strengthening trust and combating corruption using blockchain; (c) Improving market access and ease of doing business; (d) Using disruptive technology to overcome the traditional barriers of distance and limited access to healthcare and crisis-management; (e) Education, innovation and job creation; and (f) Bringing the informal sector into the mainstream economy. Back in 2000 we used terminologies such as “disintermediation”. This was a situation in which, because of technology, a layer between the customer and the supplier or manufacturer was removed. Much of this had to do with middle men who connected buyers and sellers due to market inefficiency or other. As the internet technology developed and improved, not only were layers removed, but entire processes where dismantled. Virtual markets like Amazon and Dell made it possible for buyers to connect directly with the manufacturer. Alibaba is also good example; today, you can order directly from the manufacturer completely bypassing an agent, wholesaler and retailer! What we have now is whole businesses and industries been disrupted, not just layers been removed. Disruptors and innovators exist in all economies, but many studies show that places with a strong, well developed and vibrant entrepreneurship ecosystem, increases the chances of success. Globally, the highest occurrence of overall disruption is found in MENA (70%), India (64%), Sub-Saharan Africa (60%), Australia and the UK (57%), while in Japan, only 23% of entrepreneurs identified as disruptive, the lowest figure globally. This is why our focus at Global Entrepreneurship Network Sierra Leone (GEN SL) is to take a leadership role in building an entrepreneurship ecosystem. We believe that to unleash the disruptors, the value creating and high growth entrepreneurs in Sierra Leone, an entrepreneurship ecosystem is a must. An Entrepreneurship Ecosystem is defined as ‘a set of interconnected entrepreneurial actors (both potential and existing), entrepreneurial organisations (e.g. firms, venture capitalists, business angels, banks), institutions (universities, public sector agencies, financial bodies) and entrepreneurial processes which formally and informally coalesce to connect, mediate and govern the performance within the local entrepreneurial environment’. An Entrepreneurship Ecosystem facilitates the creation of an environment conducive to collaboration, synergy, networking and internationalisation. It further encourages and spurs innovation. Evidence shows that domestic and foreign investors are attracted to countries/sectors where there is a strong entrepreneurship ecosystem. Further, the Freetown Pitch Night together with our main sponsor, Mutzig, provides a platform for digital disruptions to come and pitch their ideas. The next Freetown Pitch Night on April 4th 2018 will be Digital Disruptors. Why are disruptor entrepreneurs important? Entrepreneurs play a key role in helping realize the benefits of disruption through the jobs and wealth they create, the new products and services they produce, and in the way they encourage creativity and competition. These are the just some of the conclusions from Ernst and Young. Ernst and Young further, in a global survey, found that countries expecting to increase their overall workforce, correspond to those with the highest combined percentage of entrepreneurs who describe themselves as either the most disruptive or innovative. If we also look at some of the current drivers of economic development – human capital, technology and innovation- it becomes clear that entrepreneurs have a key role to play in the development process. In fact, we are witnessing the empowering of the bottom of the pyramid through disruptive entrepreneurs using technologies to bring financial inclusion, healthcare services and education. To further see the significance of disruptors let us look at some of the potential benefits these entrepreneurs can bring to consumers and to society. Tech-driven companies and digital business models are well positioned to disrupt the formal financial services market as they offer cost-effective and scalable solutions that can capture the mass market. Research by the World Bank, The Centre for Financial Regulation and Inclusion have shown the positive socio-economic impact of access to affordable financial products such as credit, savings and insurance. These play a crucial role, both in unlocking economic opportunities and in reducing poverty, by helping BoP consumers to mitigate the effects of negative financial shocks, and in doing so reducing vulnerability and avoiding the poverty trap. In Agriculture, climate change and agricultural efficiency and just the fact that we have to feed 10billion makes it imperative to innovate. In Sierra Leone, agricultural productivity is low due to the low use of technology and plant nutrients. Drones are already used in many parts of Africa to monitor the field during the growing season. In February of 2017, CRS, in collaboration with NetHope, flew a drone, or Unmanned Aerial Vehicle (UAV), over cashew farms in central Benin. From the images, they could see immediately were several issues the farmers needed to address. They could see where was space available to plant more trees and how many could be planted, where trees needed to be thinned out, where there had been burning, and areas for follow-up due to invasive weeds or other problems. There are now software attached to a drone that automatically send information on : tree counts, crop stress, and gradient changes that can show where water goes. These are hard to detect with the human eye, yet with this information, the field agent can use his limited and expensive time to pinpoint areas that need an in-person visit. Blockchain is an incorruptible electronic ledger that can track each transaction of a food item’s journey through the food chain. Augmented reality (AR) is already been use to layout the planting options in a field. Fertilizer companies are using this technology to demonstrate the impact straights or complex fertilizers could have on a customer’s farm. Artificial Intelligence (AI) is also now been used in Agriculture. In particular, farmers are using machine vision, where computers process visual data collected from a drone, or a smart phone. This data can be used to improve efficiency. Some companies are even using AI to identify animal behaviour and productivity. These technologies, together with some others are part of the Internet of Things (IoT): The Internet of Things refers to the networking of physical objects through the use of embedded sensors, actuators, and other devices that can collect or transmit information about the objects. The data amassed from these devices can then be analysed to optimize products, services, and operations. The interconnection of these embedded devices (including smart objects), is expected to usher in automation in nearly all fields, while also enabling advanced applications like a Smart Grid, and can be used in both crop and livestock production. An example of AI is an Indonesian with a fish feeder technology that can automatically sense the fish’s appetite and adjust the amount of feed given with the appetite. According to Gabriella Mulligan of ThisisAfricaonline.com “ New data charting investment activity flowing into Africa’s tech start-ups shows that international investors are taking notice. According to Disrupt Africa, a portal for start-ups and accelerators across the region, tech start-ups on the continent raised more than $129m in 2016”. In 2017 $195million went into African startups, with South Africa, Nigeria and Kenya the top three destinations for tech investors , both in terms of numbers of deals and total amount of funding, while there were also impressive years for Egypt and Ghana. Research by Disrupt Africa shows that in 2017 the number of African tech startups to raise funding was 159 – up from 146 companies in 2016. In 2015, only 125 startups managed to attract investment. Investor confidence and willingness to back African tech ventures is clearly accelerating. Most significant, is that those entrepreneurs that are disrupting business process and even industries are receiving the bulk of these investment. In 2017, almost one third of all funding went to fintech companies – this proportion has remained stable over the past three years. In September of 2017, the theme for the Freetown Pitch Night was Fintech. The four companies that pitched have the potential to create significant value. One of them in particular has the potential to create hundreds of jobs through its disruptive accounting app. Other sectors noted in the piece by Gabriella Mulligan of ThisisAfricaonline.com are E-health and Agri tech. Agri-tech space, for example, saw an incredible growth of 8,660 percent in the amount of funding received, as compared to 2015. Ernst and Young survey found that countries expecting to increase their overall workforce, correspond to those with the highest combined percentage of entrepreneurs who describe themselves as either the most disruptive or innovative. In Africa, these digital disruptors are best positioned to unlock the currently under-serviced mass market. In doing so, they will create significant amount of jobs. I have in the past discussed 5 opportunities that present unprecedented opportunities for Sierra Leone- Digital dividend; Digital disruptions; Ag tech; Circular Economy (waste to wealth); and Social Entrepreneurship. Entrepreneurs play a key role in realise the benefits of these opportunities through the jobs and wealth they create, the new products and services they produce, and in the way they inspire and encourage creativity and competition. As technological has become one of the drivers of economic development; and as the pace of technology change accelerates, it becomes crucial that we build an entrepreneurship ecosystem. This ecosystem will nurture and support the value created by the most disruptive and innovative minds in Sierra Leone.